I have mixed feelings about Croydon, another place in London where I have shown work in group shows in the past, and which I have photographed, particularly for its tram system, taken in 2001. You can see my pictures along ‘Line 1’ in Croydon Tramlink. It was an unusual project for me in that the pictures on-line were taken on 6×7 rather than 35mm film; as well as these medium format images I also worked with a panoramic camera as you can see above, though I’ve yet to get around to adding these pictures to the web site as promised. I still visit Croydon reasonably frequently, either to visit or meet friends, and for the occasional protest, particularly those about immigration issues at Lunar House. 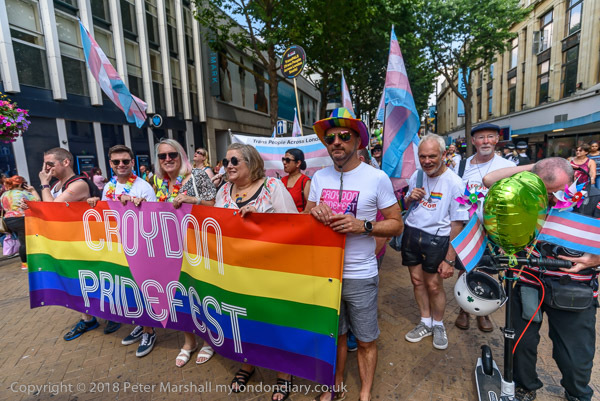 But on Saturday 14th July I was there for ‘Croydon Pride’, photographing the procession through the centre of the town to the third annual Croydon Pridefest in Wandle Park, sponsored by Croydon Council and said to be the second largest Pride Festival in the capital. 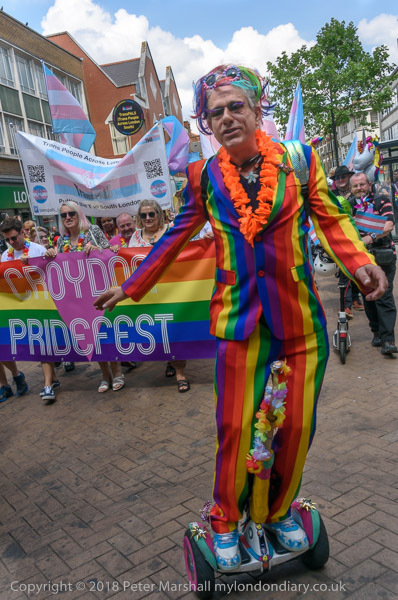 I’d given the main London Pride a miss this year, but thought it would be good to cover a much smaller and less corporate event. 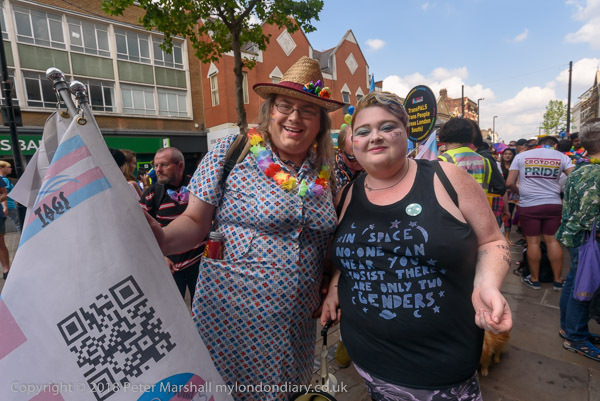 It was a much smaller and more intimate event than London Pride, and I enjoyed meeting some of those taking part and photographing them. 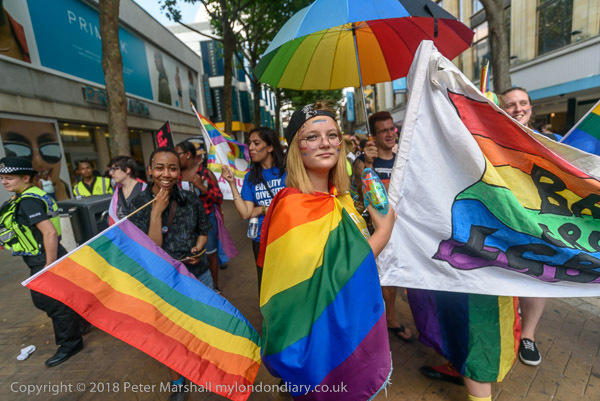 There had been fears that anti-trans activists would try to disrupt the event, but fortunately they did not materialise, and the march was a show of support for trans people, with a large banner for TransPALS, (Trans People Across London South) and others carrying flgs and placards in support. I was sorry to have to leave the march soon after the start to make my way back to central London from East Croydon station, but other things were happening there I didn’t want to miss. This entry was posted on Tuesday, November 6th, 2018 at 10:45 am and is filed under My Own Work, Political Issues. You can follow any responses to this entry through the RSS 2.0 feed. You can leave a response, or trackback from your own site.